This report contains the full transcript of an interview conducted during September 2011 in Than Daung Township by a villager trained by KHRG to monitor human rights conditions. The villager interviewed Saw T---, a 46 year old betelnut and cardamom plantation farmer who described movement and trade restrictions during 2011, specifically the closure of a vehicle road, that disrupted the transport of staple food supplies, as previously reported by KHRG in "Toungoo Situation Update: May to July 2011". Saw T--- described past instances of the theft and looting of food supplies and the burning of cardamom plantations and noted that the sale price of villagers' agricultural outputs has fallen, while the cost of basic commodities has risen. He also described previous incidents in which a villager portering for Tatmadaw soldiers was shot whilst attempting to escape, and one villager was killed and another seriously injured by landmines, providing insight into the way past experience with violence continues to circumscribe villagers' options for responding to abuse. Saw T---nonetheless described how villagers hide food to prevent theft, and covertly trade in food staples and other commodities to evade movement and trade restrictions. Saw T--- also noted that villagers have introduced a monthly rota system in order to share village head duties. The following interview was conducted by a villager in Toungoo District and is presented below translated exactly as it was received, save for minor edits for clarity and security. This interview was received along with other information from Toungoo District, including three incident reports, one situation update, seven other interviews and 204 photographs. For how many years have you been serving as the village head? Now, we rotate [the position of] village head on a monthly basis, with one person having to serve for one month. So people didn't start [rotating the position of village head] a long time ago? Yes, we only started rotating [the village heads] in 2011. How many people have to serve as village head each month? Three people have to serve as the village head each month. As you said, you are one of the monthly village heads.What are your responsibilities? I know about the government. To become the village head, did the villagers select you or did you select yourself? Could you explain to us your experiences and feelings from when you became the village head up until now? Yes, I can. There have been no difficulties this month. After the Burmese Army column moved their camp in 2010, there has not been as much forced labour as before. Within the past month, we have only received two order letters about having to attend the meetings [with the army] at L--- camp. There wasn't much special information given to us. Did the SPDC Army [Tatmadaw] not order people to do forced labour after they moved their camp? Yes [that's correct], no more forced labour. Can you remember which month and year the SPDC Army moved their camp? I can't remember the month. It was maybe in May 2009. There are over [number censored for security] households. Can you guess the population of the village? I don't know exactly how many people live here. You should ask the previous village heads about the population data that they collected. Previously, they [Tatmadaw soldiers] ordered them to do a census and collect [information on] the numbers of householdsbut they have not ordered me to collect this [information] since I have only been working [as village head] for about one month. So I don't know exactly about the numbers in the village. In your village, what kind of jobs do most villagers do? Plantations and hill fields. Some people do not get enough rice and they just carry things for daily wages. So most of the villagers work on plantations. What kind of plants do they grow on their plantations? Both betelnut [trees] and cardamom plants. How many people don't get enough food to eat every year? We have people who don't get enough food to eat but I couldn't tell you the exact numbers. They borrow rice from each other and then they pay it back at the end of the year. In your village, where do people get most [of their] income from? [People] get most [of their] income from the harvest of the cardamom plants and betelnut [trees]. How much do people buy cardamom for? I heard that the price of cardamom has got cheaper. Before, I sold it for 4,000 kyat (US $5.19) per viss (1.6 kg. / 3.52 lb. ); but now it sells for only 2,500 kyat (US $3.25) per viss. People buy the seeds. The seeds of the cardamom plants are the most expensive part. How long has your village been established for? I have no idea how long. It was established a long time ago. The village was established before I came and got married here. Has your village faced any problems? The problem is that people don't get enough food to eat. There were many problems in the past because many [Tatmadaw] soldiers were based here. This is why the villagers suffer. People couldn't do their own work. People could only do their own work for one or two days as they mostly had to work for the Tatmadaw soldiers. We had to do whatever they ordered us to do, or go if they ordered us to meet them. You couldn't live freely when you served as the village head. We faced a lot of problems between 2006 and 2009. You said that you were faced with a lot of problems between 2006 and 2009. Do you remember their brigade number or the place where the army was based? Did the Burmese Army based in N-- inform villagers regarding the moving of their camp? They didn't inform [us about the move]. They ordered the villagers to carry the rations. Neighboring villagers had to help carry things [the rations] too. We predicted that they [the Tatmadaw] would go back [withdraw] for good this time. They said that they would go back [withdraw]. They just told us that we had sent too many rations to the camp and so we had to send them back. Has the SPDC Army come to the village in the past few months? They've come here once. They just came [to the village] for a short time and they didn't say or do anything. They just visited the village. They then went to the villages of K--- and P---. Do you know their brigade numbers? I don't know. At that time I wasn't working [as the village head] and wasn't friendly with their officers. Did they come inside the village or did they stay around the outside of the village and then order you to meet with them? They came directly inside the village. There were many soldiers, about 60. They came here along the road. They just stayed in the village and didn't do anything. How many days did they stay in the village? Only half a day. Then they left. Did they catch any of the villagers' chickens? Were there any convict porters amongst them when they arrived? [They came] without them. They [convict porters] were usually included when the Burmese Army sent their rations. However, there weren't any when they arrived this time. Have you heard of the SPDC Army killing any of the neighboring villagers in 2011? I haven't heard of anything [like this]. If something happens [to the Tatmadaw soldiers] on the vehicle road,they cause problems for people who they suspect [may have been involved]. I have sometimes heard of things like that happening. But did you hear if they [the Tatmadaw soldiers] killed any people? I didn't hear that they killed people but I heard that they disturbed people. Have they blocked the vehicle road in the past? They blocked the road so villagers weren't able to buy rice [and transport it along the road] so people had to buy their rice in secret. Vehicles weren't allowed to travel along [the road] carrying rice to the village, and so the price of food went up. There is rice available to buy but it is too expensive. They blocked the trade of rice? People sent rice secretly [to the village] even though they had blocked the road. The price of rice rose. Can you remember the date when you heard about this? I can't remember. Maybe this was in April or May . Can you explain to us step by step your experiences as a villager, before you became a village head? I previously lived in D--- village. I realise that I have been serving as village head since I moved to N--- [village] to live and get married. I have suffered many things. I will explain to you as much as I can remember. I was a village head when I was living in D---[village]. When people [the Tadmadaw] ordered us to do forced labour, the villagers didn't want to go. I had to go first and then the villagers would follow me. The vehicle road that went to T--- wasn't built at that time and we had to cut down the bamboo and trees [for the Tatmadaw]. If people stepped on a landmine, they just stayed like that [received no treatment]. All the people [villagers] had to porter [for the Tatmadaw] whilst I was living in D---. [Whilst portering] one villager stepped on a landmine and was injured. 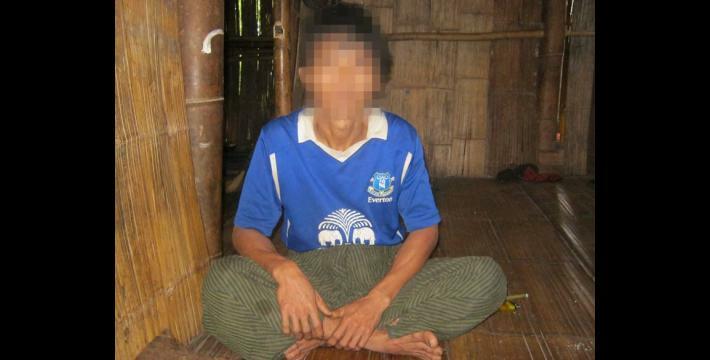 The Burmese soldiers also shot and killed a villager. I wasn't happy when I heard about the death of the villager. Meanwhile, we had to keep going and one more person was killed by a landmine. We suffered in this way until the army had set up their camp in N---. I began taking the responsibilities [of village head] when I started living in N---.The soldiers [Tatmadaw] ordered me to meet with them. I had no idea where they would go [next]. Later, they ordered me to take them to D--- [as a guide], so I went with them. The soldiers were attacked by a remote-controlled explosive device above the village when we were coming back. Soldiers were injured, and they blamed me. Afterwards, the soldiers ordered people to porter [more] things and I chose the villagers for them. However, the villagers couldn't keep carrying things [as they were too tired]. The villagers then ran away [to the village] before [they'd finished] carrying everything. The Burmese soldiers shouted at me because of this. They said: "You didn't ask your villagers [to work] until they had carried all of the loads, and no one is in control of them so the villagers went back". I then had to go by myself. When the villagers were portering for the army, I looked after them for the whole day until they had finished carrying everything. Then we went back to the village. I had to be involved with the villagers because the villagers couldn't work well without me. The Burmese Army told me that we hadn't finished everything that needed to be done. We carried as much as we could, but we had no more energy to keep working. Later, fighting [with non-state armed groups] occurred in the distance. The Tatmadaw weren't satisfied after the fighting and so they fired heavy mortars towards the village again and again. However, it was quite fortunate because the shells didn't land inside the village, but fell next to the village. They [the Tatmadaw] blamed me for the fighting occurring. The k'rer hkoh [KNU commanding officer] told me that they [the Tatmadaw] would detain me in a cell. They didn't detain me but when I went to meet with them they criticised me for planning to go on a trip [to meet them] but then not going. I replied that I didn't go because I didn't have any friends to go [with me]. They accused me of being in contact with the Ng'Bpway. I told them that I didn't have any contact with theNg'Bpway and that that was how I lived. Did you say that the Burmese Army shot and killed one person in Bh---? It wasn't in Bh---. It was by the Play Loh river on the Ma--- Road. What was the name of the person who was killed? He was my younger brother. At that time, he was over 30 years old. Why did they shoot and kill him? They ordered him to carry food. He wasn't able to keep on carrying things [as he had no more energy] and so he ran away. There were two Tatmadaw troops who went with them [the porters]. He fled into the middle of the two troops. Other troops [at the rear] had stepped on landmines and they were waiting to treat the injured soldiers. Saw Sh--- ran away when he saw the soldiers [who were waiting to treat the injured soldiers]. He didn't know that the other troops were there and they shot him as he ran away and he got hit. Was your younger brother married? Where did his wife and children live after the SPDC Army killed him? His children went to live in town. Other people [from the village] look after his mother-in-law and father-in-law. You mentioned that you attended the last meeting [between the village heads and the Tatmadaw]. What information did they talk about? They didn't discuss any special information. They talked about domestic chores training and about things that had happened in the past. They talked about regional development. They said they'd formed a sub-township in L--- and distributed electricity. The people [in L---] now have to pay electricity bills. They will be provided with water. The [name of humanitarian organization censored for security] built a big pool, filled it up with water and now distributes the water to the village. This water belongs to L--- village. It doesn't belong to our village. You said that the Tatmadaw would distribute electricity [to your village] right? Did they demand payment through taxation? How did they deduct the tax per month? We have paid them the money already. We gave it to them last year. How much did they demand per month for electricity? 3,000 baht (US $90) per month from each household. I have no idea how much power the generator creates. One generator could only distribute electricity to one hundred households. The electricity could only be distributed to one hundred households? Yes, this is the electricity that is supplied by the government. You know the Karen people are not like the Burmese people. Burmese people would steal more electricity than the Karen. Previously, I have stolen electricity from one person because their house was close to the road. Later, people saw what I was doing and so the Burmese Army took out the wire. The Burmese people had a strong electricity supply and so they wouldn't notice [the difference] on their electricity meter even if we did steal it. A moment ago you talked about domestic chores training, is that right? Did the Tatmadaw order people from each village to attend the training? How many people had to attend the training? Six people from the sub-township of L---had to go. In the past, we hired people to attend the training for us by paying them money, but we currently can't afford to hire anybody. People from our village had to go. We had to collect money [from the village] and send it to them [the Tatmadaw]. We negotiated the price and they sent the [order] letter to us after the meeting. Bp--- village tract had to send 25,000 kyat (US $32.47). How many villages are there in Bp--- village tract? There are only three villages. There are four villages, if you include K---. Did they discuss anything else at the meeting? They didn't talk about anything else. Has the township leader changed? Yes, there is a new one. Do you know the previous township leader's name? I know exactly the name of the previous leader. He was U Than Win, but I don't know the name of the new one. Don't you know the new township leader's name? I have to find out his name because I could be wrong if I tell you his name now. Do you have any schools in your village? How many standards [grades] does the school have? It goes up to fourth standard. There are about 38 students. How many male schoolteachers and female schoolteachers are at the school? There are two schoolteachers, one male schoolteacher and one female schoolteacher. Was the school formed by villagers or by the SPDC government? We reported the establishment of the school to the government and then they sent us the schoolteachers, but the villagers built the school themselves. The government only supplied us with the schoolteachers. Are the schoolteachers' salaries funded by the government or by the villagers? The government funds the schoolteachers' salaries. The schoolteachers travel a great distance to the school, so we have to collect rice, salt and fish paste for them. Last year, we reported it [this issue of food] to the education coordinator but they told us that as there is only one teacher, we should provide the food for them to eat. The education coordinator told us that this [provision of food for schoolteachers] also happens in L---. The government staff [the teachers] should use their salary [to buy food] but we still have to collect rice for them. Do you collect rice for them once per month? We collect rice for them whenever they run out. Are there any students who can't attend the school? Most students can attend school properly. How much do the students have to pay for their school fees? I don't know the exact cost of school fees. Can the students study peacefully [without disruption]? Does the government allow the schoolteachers to teach the Karen language? The government is based far away from the school so the schoolteachers can teach the Karen language. Do they just teach it by themselves [without the government's permission]? The Karen people in our village distribute textbooks on the Karen language and ask the teachers to teach what is given to them. So the schoolteachers only teach what they receive from the village. How many years ago was this school established? I can't remember. It was many years ago. Have you seen the SPDC Army or the KNU [Karen National Union] Army disturb the school during class time? They have never disrupted any classes. The school has had its own problems, such as when the schoolteachers went back to their homes and disappeared for a long time, and the students couldn't attend school. Do the students get enough stationery from the government, such as notebooks and pens? To study, the students buy things by themselves. They get nothing for free [from the government]. So the students' parents have had to pay for the individual needs of their children? The parents have to buy [school equipment]. In L---, the government has supported one or two students at kindergarten level. Out often students, the government only supported one or two of them. These were the students who couldn't buy school stationery by themselves. Do you have any clinics in your village? There is no clinic. If people are a little sick, we can treat them in the village. If people are suffering from serious diseases, we send them to L---. Did you have to pay treatment fees when you go to the L--- clinic? They just ask us to pay money for the costs of the medicine. After you have recovered, there is a donation box there, so you can put money in it if you want to. You don't have to put money in it if you don't want to. In the past few months, what kind of diseases have people suffered from the most? The most common disease has been the flu. Last summer, people suffered from dysentery. In your village, can people maintain their livelihoods without difficulties? Yes, people can work properly. Do any villagers not get enough food to eat? We have people who don't get enough food to eat, so they have to work daily wage jobs. You said that you get your rice from L---. How much do you have to pay for one sack (48 kg. / 105.6 lb.)? One sack is about 24,000 kyat (US $31.17) or 23,000 kyat (US $29.87). How much do you have to pay for one viss of meat? One viss of chicken is 6,000 kyat (US $7.79) and one viss of pork is 5,000 kyat (US $6.49). As you said, most of the villagers work on the plantations right? In the past, have you heard reports of the SPDC Army destroying villagers' plantations? They have destroyed plantations. In the past, they burnt down the cardamom plantations. The soldiers took and ate people's food and so villagers had to hide their food from them. In which village [did this happen]? In our village, because they can do this to villages far [from the town]. In your opinion, has the SPDC Army done anything to develop your village? They haven't done anything related to development. Instead they've come into the village and destroyed things. We have had to organize everything concerning the development of the village by ourselves. Why did the Tatmadaw destroy things in the village? In the past, they have fired heavy mortars into the village. People were afraid of the shelling and had to run away and sleep here and there. If we couldn't organize each other and spread out, the village could have been destroyed. We kept living as stable [lives] as possible and we supported each other. We have to keep living like this in the village. If one person ran there and another person ran here, everything would be destroyed. What do you think of the KNU? The KNU is our source of strength. If there was no KNLA [Karen National Liberation Army], we can't imagine how much the SPDC Army would oppress us. Maybe there are some questions that I haven't asked you. Is there any other information you would you like to report? I can't ask you questions [as I don't have any] more information [to report]. Would you like to report any other information? I don't have anything else to report. In order to increase the transparency of KHRG methodology and more directly communicate the experiences and perspectives of villagers in eastern Burma, KHRG aims to make all field information received available on the KHRG website once it has been processed and translated, subject only to security considerations. As companion to this, a redesigned website will be released in 2012. In the meantime, KHRG's most recently-published field information from Toungoo District can be found in the Report, "Toungoo Interview: Saw D---, September 2011," KHRG, January 2012. In Karen, the Burmese phrases Na Ah Pa (SPDC) and Na Wa Ta (SLORC) are commonly used to refer to the Burmese government or to Burma's state army, the Tatmadaw. Many older Karen villagers who were accustomed to using the phrase Na Wa Ta (SLORC) before 1997 continue to use that phrase, even though the SLORC has not officially existed since 1997. Similarly, despite the official dissolution of the SPDC in March 2011, many Karen villagers continue to use the phraseNa Ah Pa (SPDC) to refer to the Burmese government or to the Tatmadaw; see: "Mission Accomplished as SPDC 'dissolved'," Myanmar Times, April 4-10th 2011. The term Na Ah Pa was used by the villager who conducted this interview and interviewee and "SPDC" is therefore retained in the translation of this interview. All conversion estimates for the Kyat in this interview are based on the fluctuating informal exchange rate rather than the government's official fixed rate of 6.5 kyat to US $1. As of January 27th 2011, this unofficial rate of exchange was US $1 = 770 kyat. This figure is used for all calculations above. Between 2005 and 2008, KHRG documented the widespread displacement of villagers in the face of systematic and targeted attacks against villages and livelihoods, primarily in Papun, Nyaunglebin and Toungoo Districts, the three northernmost districts of KNU-delineated Karen State, giving rise to the common name for this period as the Northern Offensive. See: "One Year On: Continuing abuses in Toungoo District," KHRG, November 2006; "Attacks, forced labour and restrictions in Toungoo District," KHRG, July 2008; "Rural development and displacement: SPDC abuses in Toungoo District," KHRG, January 2009; "Patrols, movement restrictions and forced labour in Toungoo District," KHRG, September 2009. While it is not certain that this is referring to the same incident, a KHRG report previously published in October 2011 written by the same villager who conducted this interview noted that fighting occurred on the vehicle road between Gkaw Thay Der, Kler La and Toungoo towns and in Bpeh Leh Wah, Maw Pah Der, Gkaw Soe Koh, Kler La and Buh Sah Kee in June and July: "At this time, SPDC Army soldiers ordered villagers not to travel, especially by car or motorbike along the vehicle road. As they could not go and sell things [their agricultural products] anymore, they have faced problems buying rice. Some have not been able to buy enough rice, so this has become a worry for them." 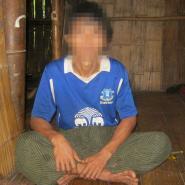 See "Toungoo Situation Update: May to July 2011," KHRG, October 2011. The Burmese phrase Ng'Bpway literally means 'ringworms' and is a derogatory term used to describe KNLA soldiers and their supporters. The date of this incident was not provided in the original interview, but according to additional information provided in February 2012 by the villager who conducted this interview, the incident occurred in either August or September 2011.